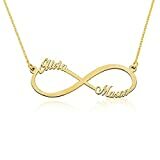 Engraved Infinity Necklace made of 925 Sterling Silver Plated in 18k Gold. Engraved with up to two names or words on each loop of the infinity symbol. This is the perfect personalized infinity necklace to wear. Get your name and your significant other on this name necklace. Pendant measures: length- 1.7", height 15mm. Pendant suspends from a sterling silver Plated in 18k Gold link chain connected to both sides of the infinity with 5 choices of length: 14",16",18",20" and 22".